Become king of the sea and achieve a high score. Now that Flappy Bird is no longer officially available on the App Store, people are feverishly looking for some form of replacement. We've seen it all - games featuring Sesame Street characters (Flappy Bert), games with WWE wrestlers (Flappy Bryan - "YES!") and others. One that's really popular right now is Splashy Fish - The Adventure of a Flappy Tiny Bird Fish. We've got a few tips that will help you get through this game with ease. Unlike other clones, which feature collision detection that's so bad that you die from hitting air, Splashy Fish is actually quite fair. You'll have plenty of room to get through columns if you tap the screen at the right amount of times, floating right through. Keep in mind you'll still lose if you manage to even brush the side of the column, so allow yourself plenty of space. Do this, and you should be able to last for a while. Splashy Fish is one of the few Flappy Bird clones that gets the pacing right, going just slow enough that you can prepare for columns that come your way. That said, don't take it for granted. Keep an eye on whatever columns are coming in and get ready to either tap towards the top of the screen or float down a bit in order to get through them. It's important to look ahead, just to get an idea of what's coming. 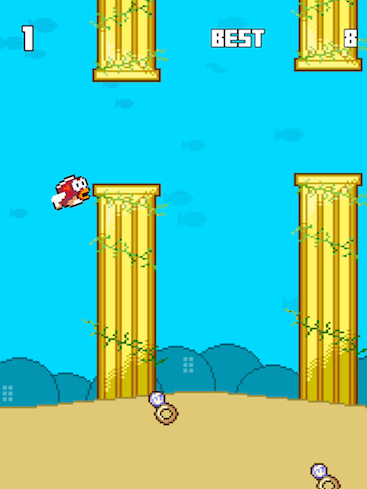 Splashy Fish isn't just a casual swim in the ocean - these columns can change rather quickly between high and low. There are times you'll get good, straight runs where they're all about the same height, but sometimes you'll be thrown for a loop. Don't panic. Adjust your taps so you sail down or float higher to get through the columns. With Splashy Fish, it's not about being a show-off and trying to miss columns by a mere centimeter - after all, no one can see your replay performance unless you post it on YouTube or something. Concentrate on getting through the columns, as it's your score that matters when it comes to GameCenter leaderboards. Finally, keep in mind that Splashy Fish follows the same basic principles as Flappy Bird, so you'll want to make sure you're not obsessing too much with getting a high score as you float through the columns. Don't forget to take a break every once in a while so you can get your concentration back. It'll certainly help your sanity, and who knows - that recharge may be all you need to get a high score.